There are many ways to deck out your wedding to suit your own personal taste and style, including incorporating camo wedding centerpieces in your reception decorations. 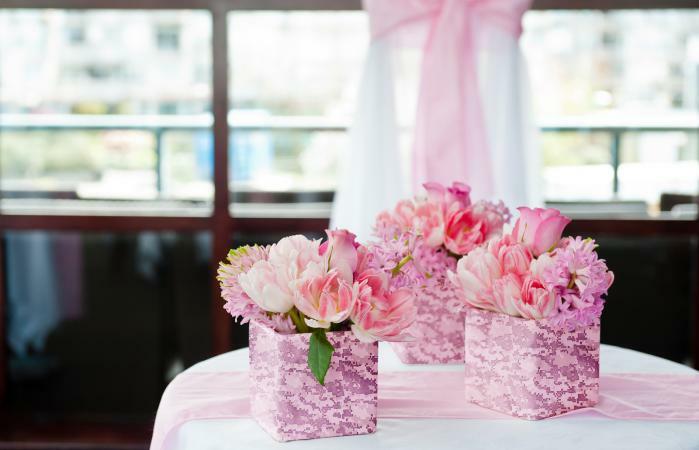 Here are a few ideas for do-it-yourself centerpieces and tips on how to incorporate your personality into your wedding reception. If you or your spouse-to-be are members of the military or enjoy hunting, fishing, or any of the other activities typically associated with outdoor hobbies, you may decide to embrace a camo theme for your wedding. 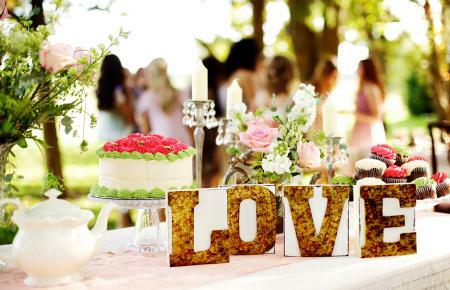 This unique choice can add a touch of personality to your big day, but you may feel it difficult to find to find appropriate decorations and camo wedding centerpieces. 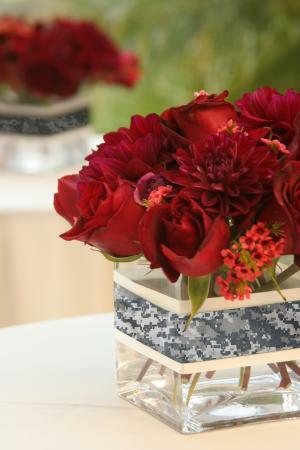 These wedding centerpiece ideas will help you bring your camo theme into the decor for your special day. Measure the height of the vase and decide if you want the camo pattern to completely cover it or just be a strip that goes around it. Then measure the circumference of the vase. Cut the fabric or paper slightly longer than the circumference of the vase so the edges can overlap. Cut it to be the desired height. Using hot glue, attach the fabric or paper to the glass, being careful to make neat folds as you work your way around the vase. Overlap the edges. Place fresh or artificial wedding flowers in the vase to complete the look. For something different, consider purchasing chocolate brown or black wicker baskets or nests. You can display these on pedestals for a more formal look or place them directly on the table for a low-key appearance. Buy camo-patterned ribbon or cut camo fabric into long strips. 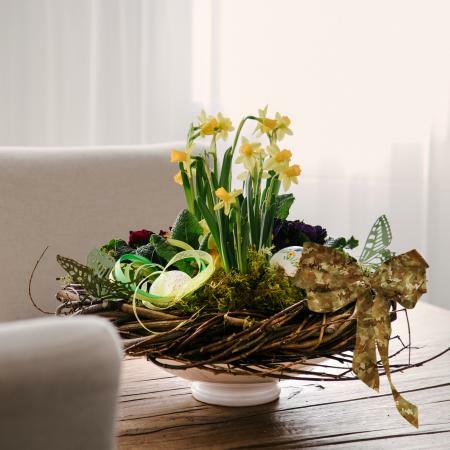 Arrange flowers and other decorations in the basket as desired. 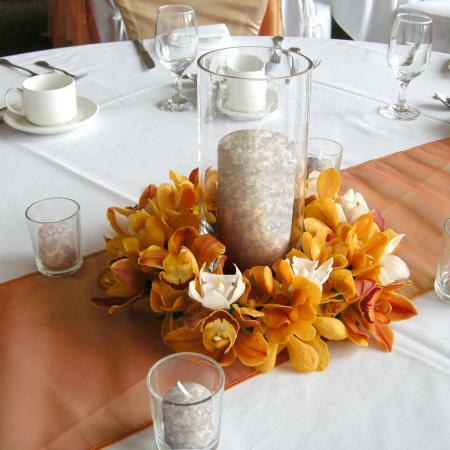 Daffodils and other spring flowers look lovely in this type of centerpiece. Make a fabric bow out of the camo ribbon or material. Affix the bow to one side of the basket. If it has a handle, you can tie it there. Make sure the bow doesn't block the view of the flowers. Express the sentiment of the day with camo-covered letters! This is a creative way to incorporate a camo pattern into your centerpiece, and it's an easy DIY project for any bride-to-be. All you need are cardboard letters, picture frame easel backs, paint, camo-printed scrapbook paper, and some decoupage medium like Mod Podge. Trace around the cardboard letters on the camo paper and cut out the letter shape. Use Mod Podge to affix the paper to the front of each letter. Paint the backs of four picture frames white and allow the paint to dry. Glue the letters onto each frame. When the glue is dry, you can stand the letters up on your table for an awesome centerpiece. If you want a subtle nod to your camo theme, add camo candles to your centerpieces. You can use traditional lit candles or keep things safe and simple with a flameless LED camo candle. Either way, it's really easy to bring in the camo. Choose a tall glass candle vase to keep the flame away from flowers or any other decorations. Make sure the vase is wider than your candle. Surround the vase with a wreath of flowers in your chosen color. Orange looks great for a fall or hunting them, but any color can work beautifully. Place the candle inside the vase. If desired, surround it with small votives in a matching theme. Camo doesn't have to be masculine. You can add some camo bows to simple flower arrangements for a gorgeous and delicate country-style centerpiece. Place mason jars on top of wood pedestals to really accent this sweet look. Purchase camo-print fabric and use pinking sheers to cut it into one-inch-wide strips. Tie raffia ribbon around the neck of glass canning jars and tie the camo fabric strips over the top. Use jars of different sizes to give this an eclectic, down-home feeling. 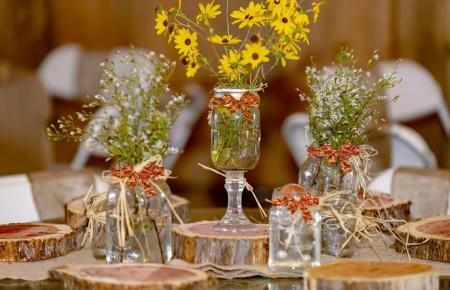 Put simple wildflower bouquets in each jar and arrange a few jars on each table as a centerpiece. 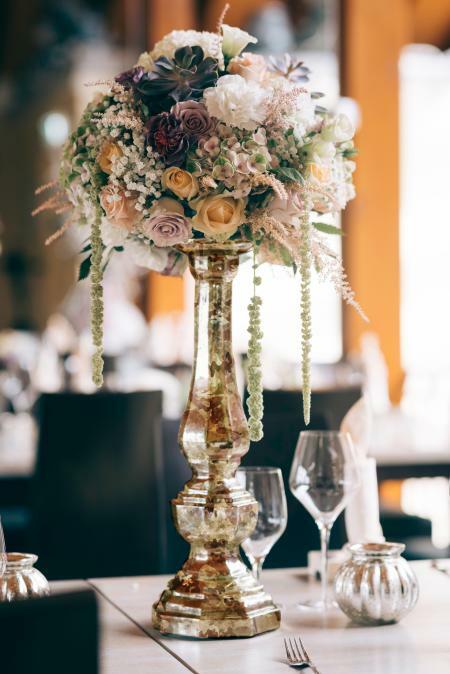 A tall centerpiece lets guests talk and make eye contact without a big floral arrangement in the way. You can use metallic craft paints in three colors and a sponge to create the camo look you want. Buy a tall vase and choose craft paints that work for the material. You can find these in any color at your local craft store. Tear a piece off the sponge and dip it in the lightest color of paint. Daube it on the vase in a random pattern. Add the next darkest color and then the darkest. Allow the vase to dry and add your choice of floral arrangement. If you want to make a truly big statement, consider purchasing camo fabric to make tablecloths or table runners to sit beneath your camo wedding centerpieces. This is an easy project that shows off your centerpiece beautifully. Table runners are long, rectangular pieces of fabric that taper at each end and sometimes include a tassel. Use a black or green tassel to dress it up. Gold or beige is also a nice choice. Layer a runner over a white or beige tablecloth, placing a vase of fresh seasonal wedding flowers tied with a camo-themed ribbon. Making tablecloths to use in place of or over plain white or beige tablecloths is a simple and inexpensive way to show off your unique personality. By purchasing fabric in bulk, you can save money. Commission someone to sew and hem tablecloths for your reception table, or if you're handy with a needle and thread, sew your own. Just to be sure to start a few months before the wedding and to make a few more than you think you'll need to avoid last-minute disasters. Don't stop with the centerpieces. Make your wedding extra special by showing off your personalities with these distinctive reception centerpiece ideas, as well as camo-inspired programs, invitations, wedding cake, and even a camouflage wedding dress. This is a creative and memorable theme your guests will love as much as you do.